His name is Hoover, and this big cat is about to enjoy a new life in Florida. Alongside crates of asparagus, Hoover the tiger will be airlifted Friday from Peru to Florida, where he’ll settle into a new home in Tampa after a lifetime of suffering. Hoover has spent his entire nearly 12 years performing tricks with a traveling circus in Peru. His harrowing journey to a new life reads like a bestselling thriller. The plot line—Operation Spirit of Freedom—was conceived by Jan Creamer and Tim Philips, co-founders of Animal Defenders International (ADI), a U.K.-based organization dedicated to stopping animal abuse and saving animals in distress. In 2012 after a two-year investigation and public campaign by ADI exposed animal abuse in Latin America’s circuses, Peru banned wild animal acts. Enforcement of the ban meant confiscating large, dangerous animals, moving them to a holding facility and caring for them—and finding them new homes. Lacking experience in this kind of work, the Peruvian government enlisted the help of ADI, which launched Operation Spirit of Freedom. Building on its initial investigation, ADI surveyed Peru’s six traveling circuses, tracking their tour locations and taking an inventory of the animals. In Peru, the operation took longer than expected. “Resistance of the circus owners, together with the many places to hide in mountains and forests, has made it tough,” Philips explains. For months, the circuses eluded authorities until in July 2015 ADI received tips about two in villages in northern Peru, close to the border with Ecuador. An eight-hour standoff with Circo Koreander followed, leading to the rescue of Mufasa the mountain lion, who had been chained to the back of a truck for 20 years. After being nursed back to health, Mufasa was released last November in Peru’s Taricaya Ecological Reserve, in the Amazon rain forest. One month later he died from kidney failure and other age-related problems. 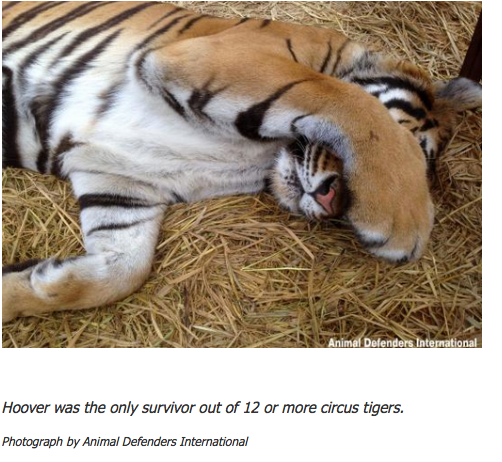 When ADI rescued Hoover, Creamer says, he was a frail, not-too-healthy tiger. In ADI’s care, he has improved, building his strength and putting on weight. “However, given his history, we believe he will always need to be monitored,” Philips notes. “He’s just not had a good life,” Creamer says. That’s about to change. Tomorrow evening at 6:15, after a seven-hour flight from Lima accompanied by Creamer and Philips, he’ll land in Miami and be trucked across the state to Tampa. At first light on April 23—his 12th birthday—he’ll be released into his new home, a spacious enclosure at Big Cat Rescue filled with shady trees, soft grass, and a spring-fed lake. 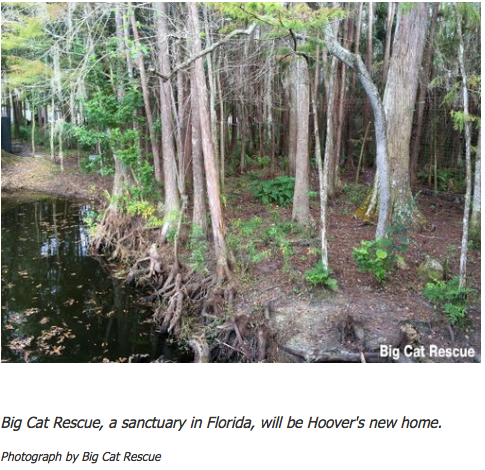 "ADI believes Big Cat Rescue will provide a wonderful home for Hoover,” Philips says. “We’ve seen the enclosure he’ll have and also the first class veterinary facilities they have on site. The climate will be similar to what Hoover is used to as well." “The cats are quite spoiled here,” says Susan Bass, the organization’s public relations director. Already in the works for Hoover is a welcome party complete with a special treat: an all-meat birthday cake.